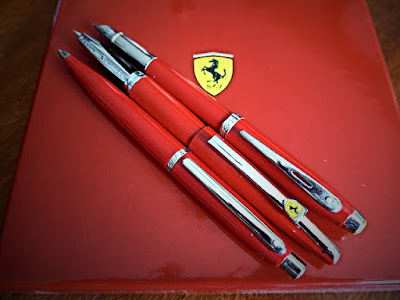 in addition to the 'VFM', '100' and 'Taranis', there were Sheaffer Ferrari writing instruments made for the '200', '300', '500' and 'Intensity' models. Perks (a great local pen shop), but I purchased the 'Taranis' (Sheaffer's first semi-hooded-nibbed pen since the 1950s)---from Jim Mamoulides of Penhero.com . In addition to being a sales site, Penhero.com is a great online reference, and has some of the loveliest pen photography on the 'net. 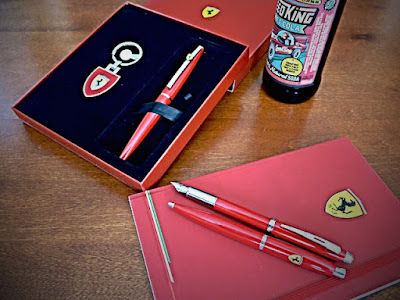 I got the 'Taranis' on closeout from Jim a few months ago, and it came in a nice gift box with a cool Ferrari keychain. The fountain pen feels nicely balanced in the hand, and its steel nib writes wonderfully. 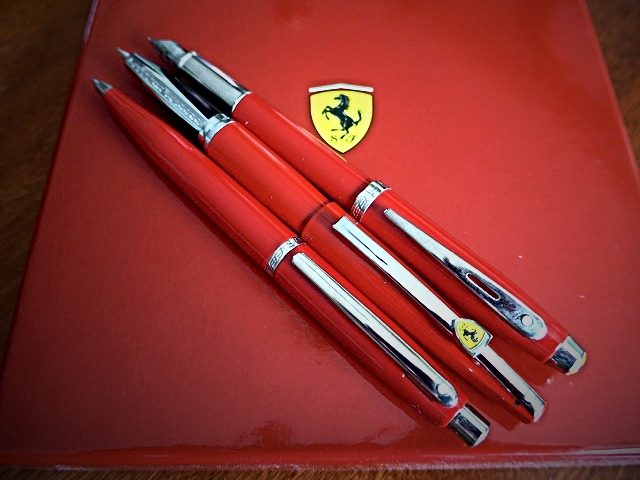 Many thanks to Jim & Perks for these stylish additions to my Sheaffer collection!